Inside: Want to raise kids who love math? Get 11 tips I use with my own kids who beg for math every single day. Most American parents know how important math is. They also know that we’re behind almost every country when it comes to math scores in our schools. How could the media let us forget it? The powers that be in public education keep trying to change that: different curriculum, more testing, more drill, more homework, new approaches. Is it working? Well, I guess we’ll know ten years from now. While we know how important math is, a whole lot of American parents just plain don’t like math. Good old math: you can’t live with it, can’t live without it, right? Will every kid be a math rockstar? Probably not. Will math in all its forms come easily to every child? No. 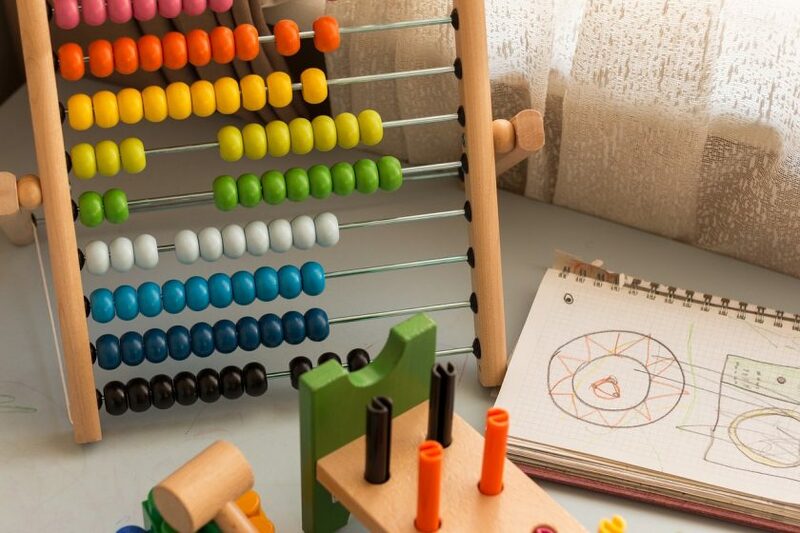 But I really believe that almost every child can appreciate math, and by changing the way we approach math in our homes from the earliest ages, some kids might even love it. When I talk with parents who have kids in traditional schools, the conversation inevitably leads to math. Homeschoolers are not much different. Sure, they have the freedom to choose their math curriculum and approach to teaching. The majority of homeschoolers know that math is an absolutely essential part of a quality education, but so many of us dread teaching it. 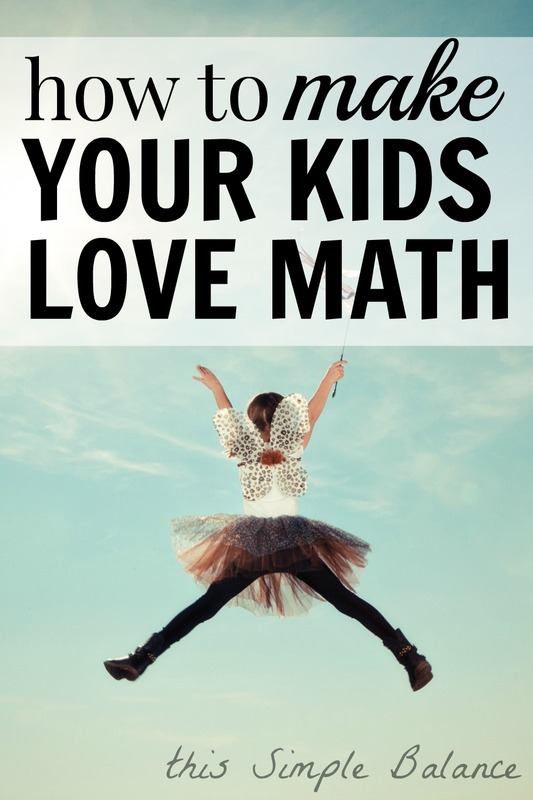 When asked about math, many homeschooling parents admit it is not their favorite subject, often trading tips for getting the dreaded math out of the way in the least painful way possible. “Should you do math first or last?” they ask the ones who have been homeschooling forever (because math is so painful, you have to decide whether to swallow the pill early on, or after the good stuff). These conversations make me sad because I can honestly say that I love math. I wonder: if parents are afraid of, and so strongly dislike math, what message does that send our kids about math? How can we help them love math when we don’t? I have loved math as long as I can remember, so incorporating it naturally into our homeschool lifestyle comes easily to me. And I can honestly say that my kids love math. They count for the joy of counting. They initiate learning multiple digit addition FOR FUN. Math doesn’t need to be the “frog” you eat first in the day because it’s so difficult. 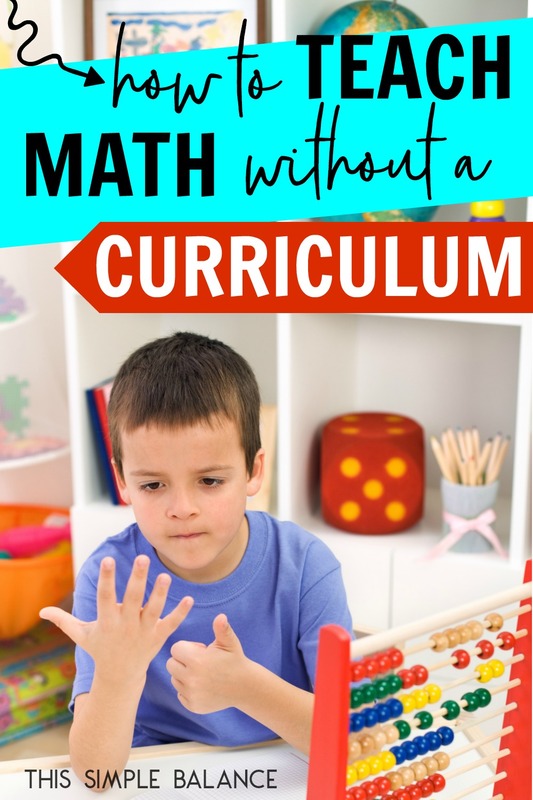 Math can truly be a joy to learn, and I truly believe that almost every kid (those with math learning disabilities as a possible exception) can know math as interesting, enjoyable, and even fun. So what’s my secret? Why do my kids beg for math while others dread it? Lean in close because I’m gonna share my secret with you: I suspect that my kids love math because I don’t really “teach math”, at least not the way a formal curriculum does. Now before you go all crazy on me, let me explain: I don’t teach math because we live math. Don’t worry: my kids can add, subtract, multiply and even divide (at least, the ones who are “supposed” to based on their age and grade level). They know how to tell time and how to estimate. My oldest, now 7, even knows Please Excuse My Dear Aunt Sally! That’s order of operations, for the non-math lovers out there. Don’t worry – I had to look it up to remember the acronym in order to teach the order of operations when she asked about it. She was inspired to do equations, by the way, after watching an episode of Rescue Bots. Equations naturally led to discussing the order of operations. 1) It’s just a natural part of our everyday life. Math is a seamless, integral part of our everyday lives. My kids see its value every day. They know that knowing how to do math is valuable, and therefore, they want to know more. 2) They think it’s fun. One survey reported that, “many Americans report feelings of anxiety and frustration when faced with having to do math. Nearly a third of Americans (30%) say they would rather clean the bathroom than solve a math problem” (source). The survey also found that the vast majority of Americans see being able to do math as being critical to a successful life. You don’t have to all of a sudden love math. In fact, if you never love math that’s ok. Hating math, however, will definitely come through to your kids. Here are a couple ways you can do to start seeing math in a positive light. Purposefully change how you view math. If you see math as painful and boring, do whatever it takes to undo that perspective. You can start by selecting some math picture books from the library and reading them with your kids. See this post by Chantel at Intentional Homeschooling for a book list to get started. If you homeschool, I also highly recommend checking out the Life of Fred elementary math curriculum. Now I know that people have strong opinions on Life of Fred (they either love it or hate it). Do I think it’s the end all be all of elementary math? Nope. But my kids sure do laugh a ton when we read it. Life of Fred reinforces that 1) math is a vital part of everyday lief and that 2) math is fun. It makes kids love math, plain and simple. That’s why we use it for now, along with lots of other real life math, which I’ll get to. Personally, I really don’t love to play. As an ISTJ/ISFJ (Myer’s Brigg’s type), my strengths lie in tending to my kids’ basic needs (food, clothes, cleanliness) and emotional needs (fostering emotional development and assisting my kids in making relational connections). However, when I listen to my kids play, I hear them doing SO. MUCH. MATH. They count; they find patterns; they talk about time. Just take a little time to play and try to see math the way they see math. 1) Learn math with them. When equations came up with my daughter and I wanted to teach order of operations, I wasn’t ashamed or embarrassed. I didn’t pretend to know what I was talking about. As parents, and adults in general, we are often afraid of not knowing something. But when we let our children into the fact that we don’t know everything, but that we do know where to go to get the information we need, we teach them how to be life-long learners. Learn it with them! If you think what you’re learning is cool, then say so! Your kids will value and remember learning alongside you. Special Note: If you aren’t good at math, that’s ok! While humbling, sharing this with your child can lead to amazing conversations about how everyone has different strengths and weaknesses. 2) Make math a part of your everyday conversation. When we walk places, we learn about miles. When we bake, we learn about fractions. When we are counting down to an event, we learn about time. When we want to figure out how long it will take us to save money for something, we learn multiplication and division. Math is everywhere, just waiting for us to draw attention to it. So much of daily life is an opportunity to learn math. You just can’t help it. 3) But don’t overdo it. Wait a second! You just told me to make math a part of our everyday conversation, and now you’re telling me not to? No. What I’m saying is to go with your child’s interests. Sometimes, I can over explain and go more in depth than the subject warranted. Basically, when you start to see that glazed look in your child’s eyes letting you know he’s no longer interested? Stop right there. Too much explanation beyond readiness and interest, and they’ll think math is boring. 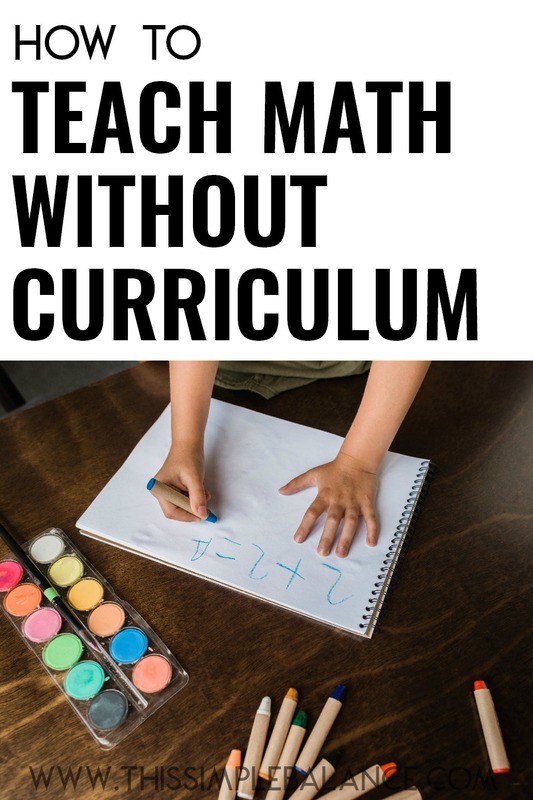 As you practice incorporating math into your everyday conversation, you’ll start to learn how to give them just the right amount of explanation and practice to match their interest level. You’ll also learn to back off when they are ready to move on. Don’t worry – they’ll be interested again, and when they show interest, they will be eager and ready to learn whatever it is that you wanted to teach them later on. It’s a delicate balance. 4) Take your kids grocery shopping. If you are having trouble getting your kids interested in learning how to do multiple digit multiplication and long-division in their heads, take them grocery shopping. I’ve always been a money-conscious shopper, but since I quit using coupons and our family has expanded, I’ve become even more so. I try to talk through my grocery store math problems out loud when my kids are with me. I point out good deals and explain at their level how I know whether it’s a good deal or not. I explain why I want to use our grocery money wisely (so we have more money for other fun things). They see the value of knowing how to do math quickly in your head. 5) Offer paid jobs in your home. Kids who earn money love math. Plain and simple. They get to count every dollar they earn. They are constantly charting their earnings – adding, multiplying, dividing. How many dollars can I earn each week? If I earn $2 each week, how much money will I have in 4 weeks? If I want to earn $10 in three weeks, how much will I need to earn each week? Earning their own money shows kids that math is valuable knowledge worth pursuing. 6) Talk about money and your budget. My kids are aware that we have specific amounts of money to spend every month on certain things. We discuss how much rent we pay, how much we have to spend on eating out, and how much money we have for groceries. Money doesn’t grow on trees. We work to earn the money we have. Money is finite. We only have a certain amount. Knowing how to manage your money is a valuable skill. 7) Make your own calendars. Printed calendars are wonderful, but I’ve found that making our own calendars each month accelerates calendar learning. When kids make their own calendars (with your help, of course), they pay closer attention to them. They regularly ask about the date, cross of the days as they pass, mark special days and count down to them, gradually learn the days of the week and all the numbers associated with calendars. Hands on learning is often the best kind. 8) Display a clock (or many clocks) in your home. Just like displaying maps in your home piques interest in geography, displaying clocks leaves kids no choice but to ask about telling time! When you, the parent, look at the clock and easily know exactly what time it is, your kids will want to know, too. With tons of practice, they eventually get the hang of it. 9) Play lots and lots of games. So many games use math. My older children were playing Monopoly just the other day and were using math constantly. I was able to help them do mental math, explaining many different ways they could do the problem in order to get the correct answer. Caitlin Fitzpatrick at My Little Poppies loves using games for learning in her homeschool. She provides several math games in this post and this one. 10) Consider purchasing a few “math” toys. While I did mention getting rid of our math manipulatives (you can use blocks or any other everyday object for counting! ), we did hang onto two math-related toys. I love minimalism, but I am finding it harder and keep our possessions to a minimum with a big family and with homeschooling. The two math toys we own that have most inspired math learning are an abacus and these mini clocks. I also plan on getting this toy for multiplication. 11) Read math picture books. As I mentioned earlier, children’s math books are a great way to expose your kids to math (see above for links to a book list). Another favorite book we discovered is the Bedtime Math series. Each book in the series contains several short math stories (word problems) that your kids will find hilarious. Plus, you can use it with multiple ages as each “story” gives three problems for different age levels/abilities. Will we ever do formal math? I believe we will. Obviously, each child will be gifted differently and pursue advanced math to different degrees. For now, I believe that the best math foundation you can give your kids is a love of learning. The list above is by no means exhaustive. 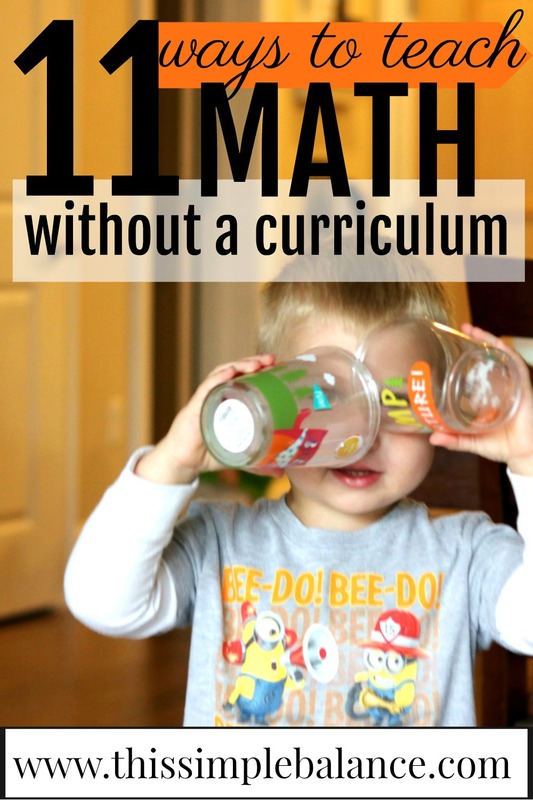 I am sure that you will come up with several more ways to teach math without curriculum.When kids know something is valuable and fun, they just can’t wait to learn it. That was his favorite airplane! What a great post! I’ve read a lot about how to help kids love to read, but you don’t often hear about math. I love that you are talking about how to get kids to love math, because that’s really important too! My mom is a math teacher and she talks about this all the time. I loved your ideas, especially the ones like taking them to the grocery store or making your own calendars, to show kids that math really does apply to real life and is useful. Thanks Charly! My parents are both teachers (my dad was a math teacher before transitioning to higher education). 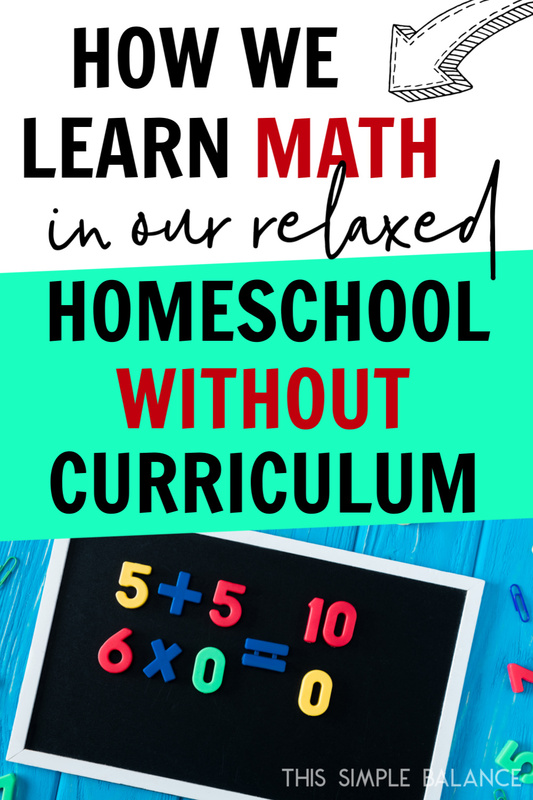 They probably have a lot to do with how naturally it comes to me for homeschooling, but I just want my kids to love learning and math can be tricky sometimes. Love this! We have enjoyed the book Moebius Noodles for lots of playing math ideas. Thanks so much for the book suggestion! We will definitely check it out from the library. We love new math books. If your library doesn’t have it, you can download a PDF version for a donation at naturalmath.com!